The DEWALT DWFP71917 16-Gauge 2-1/2-in Finish Nailer is ideal for interior trim, baseboards, cabinetry, door and window casings, furniture, crown moulding, hardwood flooring, stairs and panelling. Adjustable belt hook. Kit Includes: Nailer, 1/4-in. swivel fitting, sample finish nails, carrying case and extra no-mar tips. Bostitch Finish Nail, 15 Gauge - 2 1/2 In. Bostitch<sup></sup> manufactures over 2000 types of fasteners. Each fastener is engineered for optimal performance in Bostitch<sup></sup> tools, and for exceeding the performance expectations of our customers. Our goal is to continually increase efficiency, productivity and quality, and to ensure building code compliance through the ICC ESR 2020, ICC ESR 1539 and ICC ER 5426 reports. Our team of engineers leads the industry in innovation and design. Utilizing our advanced laboratory, our team of engineers conducts environmental testing to study the effects of storm forces and other weather conditions, withdrawal testing to evaluate new coatings, penetration testing to evaluate drive characteristics, and development testing to optimize withdrawal, shear and pull-through performance. At only 10.5-inch tall the DeWALT DWMC150 compact metal connector Nailer easily fits into tight spaces around the jobsite. Its easy nail placement makes hanging metal connectors fast and easy. Its durable rafter hook ensures it stays put when you need both hands free. The DEWALT DWFP12232 18 Gauge 1 1/2-inch X 1/4-inch Narrow Crown Stapler Kit features a long life maintenance-free motor to keep from staining the work surface. A tool-free depth-of-drive adjustment with detents assists in the proper setting of staples. The Magnesium body delivers strong & lightweight design, and the adjustable belt hook allows the tool to be kept near the user. Powered by the DeWALT XRP battery system, the Heavy Duty 16 Gauge 1-1/4'' to 2-1/2'' Cordless Finish Nailer Kit provides the speed, durability, and power you expect from pneumatic tools. The combination of DeWALT battery technology and a highly innovative mechanical design brings you a true solution for finish carpentry applications that doesn't require the use of fuel cells or the inconvenience of set-up time associated with compressors and hoses. Kit includes 1 hour charger, 18V XRP battery, reversible belt hook, no-mar tip, DEWALT safety glasses and kit box. 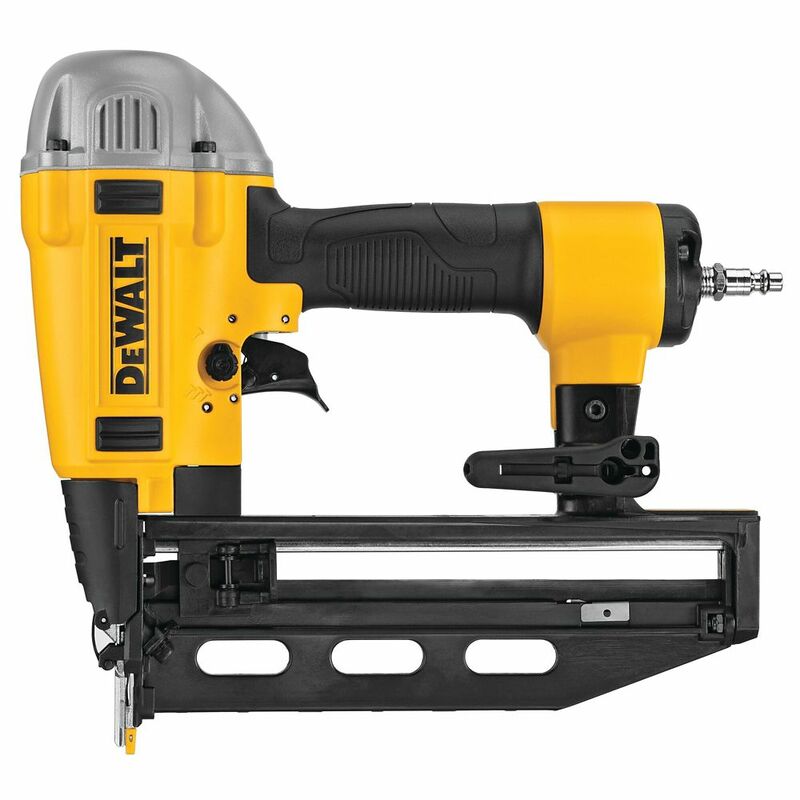 DWFP71917 16 GA Precision Point Finish Nailer The DEWALT DWFP71917 16-Gauge 2-1/2-in Finish Nailer is ideal for interior trim, baseboards, cabinetry, door and window casings, furniture, crown moulding, hardwood flooring, stairs and panelling. Adjustable belt hook. Kit Includes: Nailer, 1/4-in. swivel fitting, sample finish nails, carrying case and extra no-mar tips. DWFP71917 16 GA Precision Point Finish Nailer is rated 4.5 out of 5 by 115. Rated 5 out of 5 by Jak from Works well, worth the money. ... Works well, worth the money. Rated 5 out of 5 by Cyberrgd from Ready to use, easy to load.Why did I not but... Ready to use, easy to load.Why did I not but this sooner???? Rated 1 out of 5 by Fred from Nails would jam every time. Returned this item and purchased... Nails would jam every time. Returned this item and purchased the air compressor version. Much better. Rated 5 out of 5 by MarathonPaPa from This was a great upgrade from my Porter Cable. ... This was a great upgrade from my Porter Cable. Features I love:1) The Precision point technology makes it easy to see where the nail is going2) grip feels great3) Easy switch between sequential and contact actuation4) Jam free mechanism easy and fast5) Depth adjustment easy.